Denver finishes the regular season with a 54-28 record and 34 wins at home (34-7), which is the best mark in the NBA. 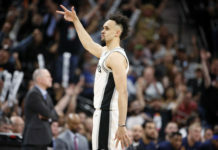 Because of the Nuggets phenomenal regular season, they head into the postseason as the number two seed, which means a date with the seventh-seeded, San Antonio Spurs. Even though the Nuggets had already cemented their status as a top-3 seed before Wednesday night, Denver still had a lot to play for as they were looking to lock up the 2-seed. By doing so, the Nuggets secured homecourt in the first two-rounds of the playoffs. The Nuggets were hoping to get a little help from Portland, so they could hopefully avoid Houston till the conference finals, but the Trail Blazers dropped their game in Sacramento. With that game out of Denver’s hands, the Nuggets only had one thing they could control and that was securing the 2-seed with a win. Denver did just that as they began the game on a 9-4 run that set the tone early on. Even though the Timberwolves were resting a lot of their normal starters, they still put up a fight as they countered with a 5-0 run to tie the game up at nine. Around this point of the quarter is when things really started to slow down as neither team could get into a rhythm offensively. The remainder of the first quarter was incredibly slow paced that ended with Denver taking a 22-21 lead after 12 minutes of play. The first quarter consisted of almost no energy by either side as both teams were looking for a jumpstart to begin the second period of play. Neither team got it though as both Denver and Minnesota played sluggish in the opening minutes of the quarter. That continued until Denver finally started to make shots again and got a big dunk from Malik Beasley to get their offense rolling. Minnesota was battling though as they stayed within striking distance of the Nuggets for most of the second quarter. 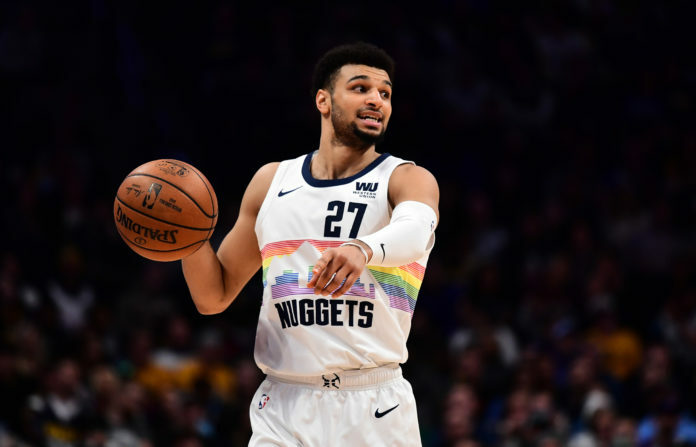 Because of that, the Nuggets only took a 51-50 lead into the halftime locker room, which came courtesy of a Jamal Murray step-back jumper at the first half buzzer. Murray finished the first half with 10 points to go along with five rebounds and three assists. Nikola Jokic led the Nuggets offensively at the half with 15 points on a highly efficient 7-of-11 shooting from the field. Just like what happened in the first half, neither team came out of the locker room with much energy to start the third quarter. The Nuggets ended up trailing for the opening portion of the third quarter, until they went on a mini-run to take a 5-point lead with just over four minutes remaining in the period. Minnesota was not going away though as they countered with an 8-0 run to take a 68-65 lead with 3:15 left in the third quarter. Minnesota only built on that lead to close the quarter as they took a 79-73 lead into the final 12 minutes of play. The Nuggets were going to have to string together a solid fourth quarter if they wanted to avoid a terrible loss to end the regular season and lock up the 2-seed. It was looking bleak though as Minnesota was playing inspired basketball and looked like a team that wanted to head into the offseason on a high note. 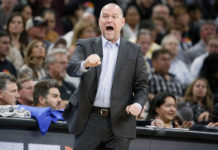 The Nuggets hopes of winning the game were getting even lower to start the fourth quarter as Minnesota opened the period on a 5-0 run to take an 11-point lead with just under 10 minutes remaining. Denver continued to scrap and claw, but the Timberwolves had a firm grip on the game as they led 92-82 with 4:47 left in the game. Denver was still in it though as they made it a 5-point game with just under two minutes remaining in the game. Then — just 20 seconds later — Paul Millsap made a big three-pointer to make it a 2-point game with 1:30 to play in the fourth quarter. The Nuggets would take the lead just a few possessions later as Murray hit a three-pointer to give Denver a 96-95 advantage with 31 seconds to play. A couple defensive stops and two big free-throws by Jokic was all Denver needed to pick up a thrilling 99-95 victory. Stat leaders for Denver were Murray, who had a solid game finishing with 17 points on 6-of-12 shooting from the field to go along with eight rebounds and seven assists. 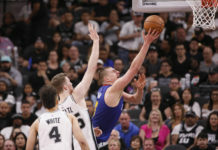 Jokic also finished with a nice stat line of 29 points on 13-of-26 shooting from then field, while also hauling in 14 rebounds and dishing out two assists. Other Nuggets who finished in double-figures were Gary Harris (14) and Will Barton (10) as both played a role in Denver picking up the victory. Denver will be back in action this weekend when they open the first round of the playoffs against San Antonio.